Usually I avoid talking about using the restroom on this blog, but I think it’s time we address the topic of going to the bathroom outside. I hear way too many women say that the reason they won’t go camping is because they don’t like the idea of peeing in the woods. It makes them uncomfortable. I get it, it’s not comfortable to hold a squat, going to the bathroom in the middle of the night isn’t enjoyable, and most of us aren’t used to not having a proper porcelain throne. But going to the bathroom outside should not be a reason to miss out on fun and scenic camping trips, okay? Especially if you follow some basic tips I’ll cover here. It’s just you and beautiful nature. Think of it this way—you didn’t have to stand in line and there are no unsettling sights to shock you when you open a stall door. The key to comfort here is to hold onto a small tree with both hands, and plant your feet apart on either side. Stick your hiney out behind you. This is much more comfortable than squatting. Avoid any tall grasses which might tickly your hiney. Whenever a blade of grass frisks me, it always gives me a shock! Stomp around on the grasses to make a flat, tickle-free zone. Look around you to be sure you aren’t squatting near a thorny plant or a snake. Ziploc bag or grocery sack for storage (it’s probably not best to leave paper out in the woods, unless you’re in a really remote area). Sometimes these can be really nice, actually. The bathroom at Pedernales Falls State Park and Bastrop State Park are good examples. There is really nothing to fear with these, except some scratchy toilet paper. I like to bring my own hand towel and hand soap when I go just because the ones they provide aren’t very nice. Optional: you could bring your own toilet seat covers if it gives you peace of mind. If this situation is unavoidable, I bring my own toilet seat covers and toilet paper. Call me high maintenance but these little things make me more comfortable! Before deciding what park to camp at, look at the website and find out what kind of restrooms are available. If your only option is compost toilet, and that makes you uncomfortable, choose a different park. 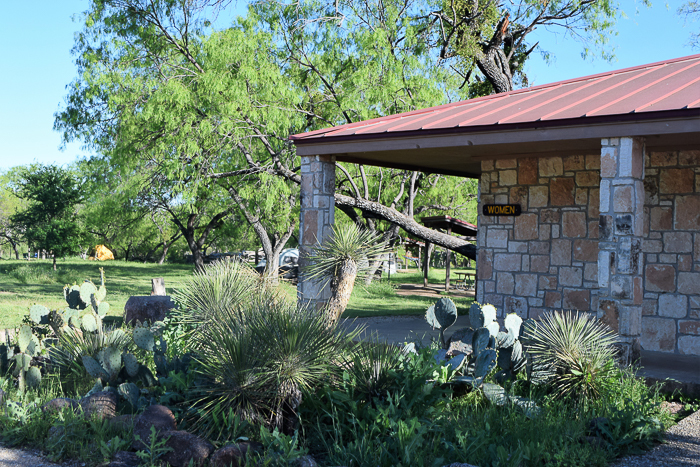 Most of Texas’ popular parks have normal restrooms. Bring your own disposable toilet seat covers. Bring your own toilet paper. Always keep a little bit of TP in your day pack whenever you’re out hiking. Bring a Ziploc or grocery sack to carry it back to a trashcan in. You can discreetly hide this in your daypack until you find a trashcan, and then toss this in the nearest bin. Bring hand sanitizer or soap. If you don’t have access to a sink, you’ll want hand sani or some wet-ones wipes. (I prefer wet ones.) When you’re at a public restroom at a campsite, they don’t always provide soap. Bring your own hand towel. When I’m camping at a park with restrooms, I also like to bring my own hand towel because it’s a nice little luxury from home, and it’s way better than the air dryers or brown thin paper towels provided. This obviously does not apply to backpacking—in which case, you won’t want to carry this. An hour before bed, stop drinking. Get your required daily dose of water, just do it with ample time before bed so you are less likely to need to pee in the middle of the night. Use the buddy system. Make a deal with your tent buddy that you will accompany each other to the restroom if you have to go in the middle of the night. Trust me, this makes the whole experience much more pleasant. Furthermore, it’s safer. Dress in something for bed that you won’t mind walking to the restroom in later. If you wear glasses, set those out somewhere that you can easily locate in the middle of the night. If it’s cold, set out your warm pants, fleece, hat, and moccasins/tennies next to your sleeping bag so you can just easily put them on when you wake up and have to run to the potty. I hope these tips help you feel a little more comfortable with this angle of camping. Take it from my many years of camping, it’s really not that bad and you will get used to it! 2 Replies to "A Girl's Guide to Using the Restroom in the Woods"
Practice using a “Go Girl”! Practice using a “Go Girl”! It can be very handy.